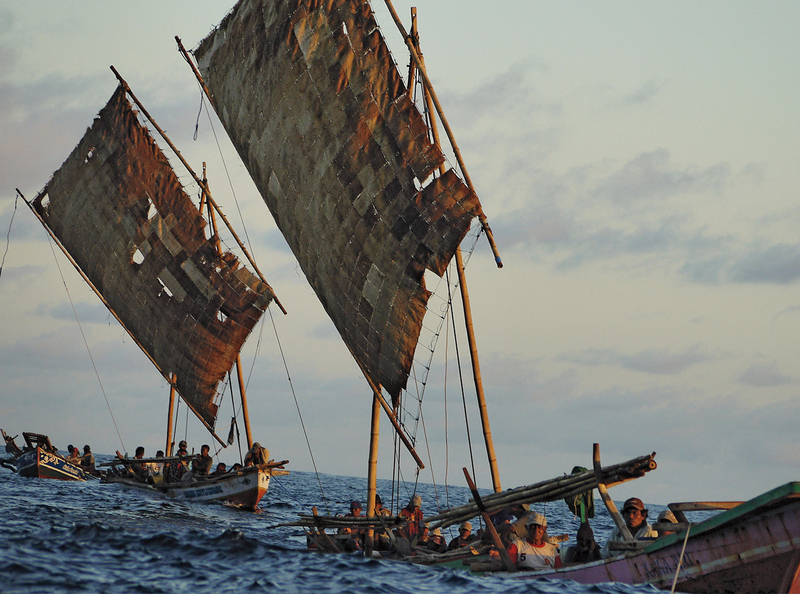 This article is adapted from Doug Block Clark‘s The Last Whalers: Three Years in the Far Pacific With a Courageous Tribe and Vanishing Way of Life. WHEN I FIRST HEARD STORIES about a tribe that hunted sperm whales with bamboo harpoons, I didn’t believe it. It was 2011, and I was living on the backwater Indonesian island. Locals told me all sorts of things—that dinosaurs lived in the surrounding jungle, for instance. But once I had verified that several anthropologists had indeed written about this indigenous group, I decided I had to see them for myself. 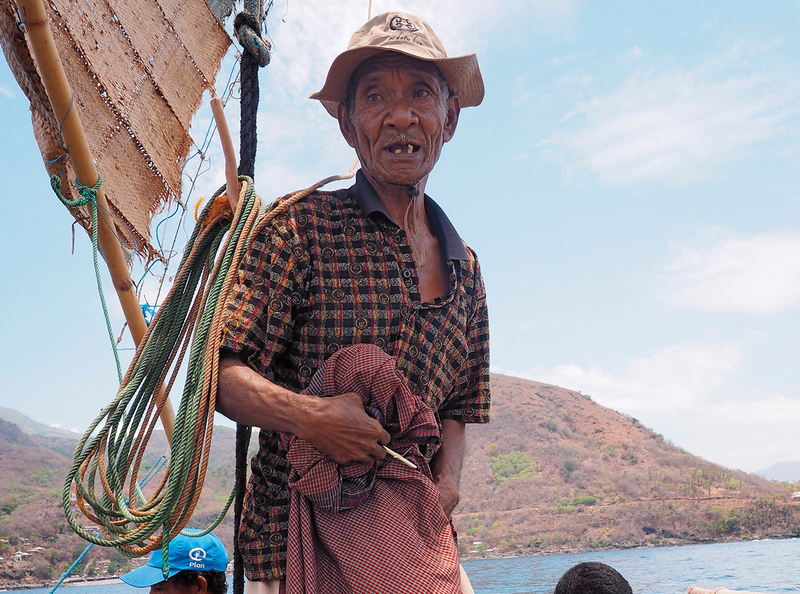 It took a week of ferry hopping to reach Lembata, the tribe’s even more remote cranny of the archipelago. 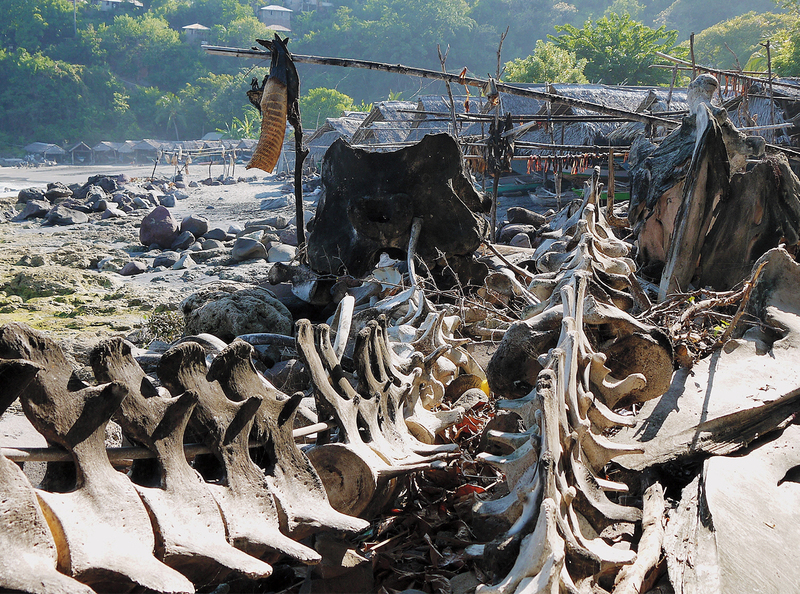 Finally, after hitching a ride on a dump truck turned bus that took me on a narrow dirt road over a volcano, I stepped onto a beach littered with colossal whale skulls. 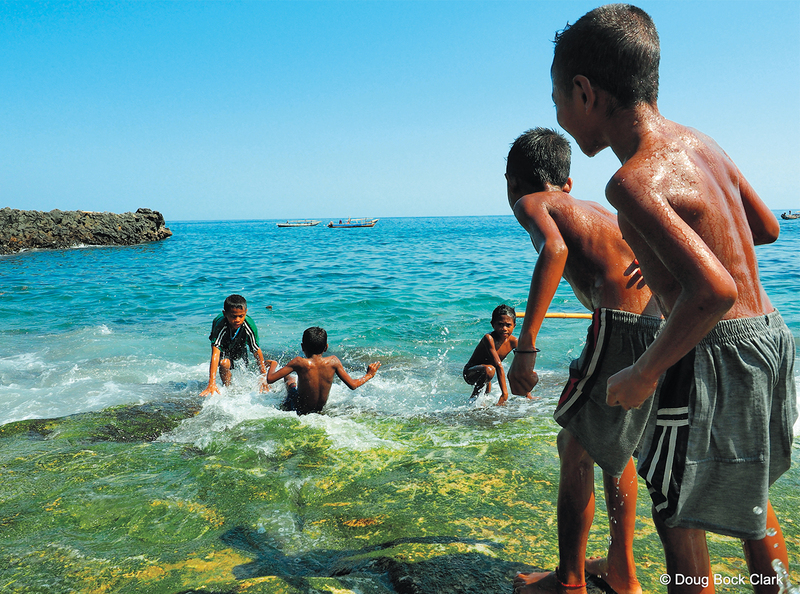 This was Lamalera, home of the world’s last true subsistence whalers. The 1,500 Lamalerans get most of their calories by harpooning everything from sharks to devil rays, but their most important prey is the 20 or so sperm whales they kill annually. (Sperm whales still have a worldwide population in the hundreds of thousands.) They use every part of their catch, drying the meat to sustain them through lean times, and trade leftover jerky with neighboring farming tribes in an ancient barter economy: Six inches of dried flesh converts to a dozen bananas. Wandering down the bone-strewn beach a few days later, I met Ben Blikololong, a 24-tear-old training to become a lamafa, a harpooner. He explained that the tribe still honored the Ways of the Ancestors, a set of rules of everyday conduct passed down through the generations which dictate that the Lamalerans hunt for their livelihood. Soon, however, he was questioning me about European soccer and American punk-rock bands. For I had arrived at a pivotal moment in Lamaleran history, when the modern world was colliding head-on with the Ways of the Ancestors. Ben invited me to join him at sea the next morning as he studied under his father, Ignatius Blikololong, one of the tribe’s most renowned lamafas, who was nearing retirement. The next dawn, I helped Ben, Ignatius, and a dozen other men raise a sail made of palm leaves over their téna, a majestic 35-foot-long wooden whaling boat built without nails or other modern components. We rode the wind into the deep ocean, but once the breeze subsided, we powered up an outboard engine to chase small game. That day we did not catch anything, but over the next two weeks, I witnessed Ignatius and Ben’s older brothers catch several sharks and just miss an orca while Ben studied their tactics. As I left, son and father told me to come “home” soon. When I returned in 2014, this time with the intention of spending months to write a book about the Lamalerans, much had changed. The outboard engines were now ascendant, and a new type of small motorboat, the jonson, was used for everyday hunting of small prey. After much contentious debate, though, the tribe’s council had ruled that the Ways of the Ancestors dictated that only a téna could attack sperm whales, so when those behemoths were sighted, the ancient boats still launched. Ben had also changed: Now, he confided to me, he wanted to move to the tourist mecca of Bali and become a DJ. He was afraid, however, of disappointing Ignatius, who was pressuring him to continue the Ways of the Ancestors. Despite being midway through his seventh decade, Ignatius could still take down a whale by himself. In addition to being the one of the most famous harpooners of his generation, he was its greatest shipbuilder: Roughly a third of the téna fleet was his handiwork. He would spend days adzing the boards of a téna so that when they were fitted together like the pieces of a puzzle, no palm gum was needed to seal the cracks between them. Even resting, he would weave a basket from lontar palm leaves so snugly that his nieces could carry water from the well a kilometer away without losing a drop. He took the time to dissect whale carcasses with young hunters, showing them where to puncture a bellows- like lung or perforate a boulder-size heart, a practice that had earned him the proud nickname Professor Harpoon. The same perfectionism that he focused on crafting a téna, he had applied to rearing his children. He instructed them in the Ways of the Ancestors as he had been: exactingly, severely. As a boy, if Ignatius made a mistake while adzing boards for a téna, his father would smack him. Such tough love was standard at the time and still is not uncommon in Lamalera. But his terror had never lessened his love for his father. He had revered him in an Old Testament way: with a mixture of awe, dread, and puzzlement. Perhaps it was no surprise, then, that he expected the same deference from his own sons. In harpooning, sailing, shipbuilding, rope winding, whale butchering, and all the other skills of a Lamaleran man, he made sure they excelled. As Ignatius saw it, in demanding perfection, he was preparing them for the world’s tribulations as best he could. Since time immemorial, Ignatius’ Ancestors had been harpooners. By 2014, people were saying that one of the last true lamafa bloodlines belonged to his family—which made Ignatius feel it was even more important to keep the tradition going. Only Ben had yet to earn his harpoons. “THIS, MY SON, IS HOW you kill a whale,” Ignatius had told Ben, more than a decade before, when his son was 13. He held aloft the great harpoon head, nearly a foot of black iron, the edge of which had been honed so many times that it had become an uneven silver razor. The weapon had none of the industrial perfection of a pistol, which kills impersonally from a distance—instead, in each nick was a war story that Ignatius and Ben knew intimately. Ignatius handed Ben the weapon. It was even heavier than it looked. “Can you feel it?” Ben knew his father meant not just its perfect balance but also its spirit. Ignatius had told him that the soul of the harpoon head was linked to that of both his Ancestors, and through them to his own soul. Ignatius showed Ben how to screw the spearhead into a bamboo V-clamp inside the neck of the great harpoon shaft. Sixteen feet long, the weapon almost tipped Ben over. Even once he steadied himself, he could not keep it from swinging every which way, as if it had a life of its own. This meant something to Ben, as he had always been smaller than the other children. Only recently, though, had he realized that everyone in his family was undersize, including his father. His people possessed the wiry bodies of runners rather than the gladiator builds of many of the other lamafas. Ignatius guided his son through each of the seven harpoon heads, nine ropes, and 10 harpoon shafts that fill a téna’s weapons rack, methodically explaining the situations and prey that each combination was used for— ballista-like harpoons for large prey like manta rays and long, light throwing harpoons for dolphins. Occasionally, after that, when they encountered a new, rare type of prey— dugong, Cuvier’s beaked whale, false killer whale—Ignatius would explain its anatomy as they butchered it on the beach. And at night, he would tell instructive tales of old hunts while his sons scooped up fresh fish and red rice using coconut shells, for Western dinner- ware had not yet arrived in Lamalera. But mostly Ben stood behind his father and watched how he balanced with a tiger’s grace on the hâmmâlollo, a platform at the boat’s prow. He noted the hand signals his father used to direct the rowers during the chase. He marked when his father leaped and how he javelined the harpoon. But for all the years Ben apprenticed, the most action he was involved in was “doubling,” adding a second harpoon after his father had already sunk the first, and only for smaller prey like dolphins or mantas. By the beginning of the hunting season in 2014, Ben had helped harpoon all types of sharks and small rays, but he could not call himself a lamafa: He had yet to command a jonson or a téna and spear prey from it. He was 27. His brothers had become lamafas before they turned 20. Ignatius promised that soon Ben would get his chance. What is most important is not the strength of the lamafa’s arm but the strength of his mind and heart, he would remind himself. What he loved most about the saying was the implicit acknowledgment that he and his father shared a spirit that transcended their bantamweight bodies. Eventually, however, he began to wonder if the lessons, more than teaching him simply to mimic his father, were supposed to make him his father. Then he would try to stare past his father’s shoulder blades to the sea. RAISING HIS SONS, Ignatius was forced to confront a choice that his father had not: whether to send them to the government schools opening across the island. The decision about his elder children was easy because in the mid-1970s Lamalera had only an elementary school. But soon, the advantages of an education were becoming clear, as the first parents to send their children abroad to get schooling and then work started to receive cash-filled envelopes when the postman led his donkey laden with mail over the volcano. When Ben was 16 and asked if his father could pay for high school in Lewoleba, the island’s capital village, Ignatius assumed his son would not be gone long. The sea would call him home. For what did the modern world have to offer a man from a bloodline of great lamafas? Still, he made Ben promise to return during all his school breaks to join Demo Sapang, the family téna, so that he would complete his training as a whaler. “And don’t come back fat,” Ignatius said, “or embarrass me by forgetting how to tie your knots, you understand?” One morning soon after, Ben fit his belongings into a battered backpack, pressed his forehead to the knuckles of his father and his mother, and rode the dump-truck-bus over the volcano. When he returned three months later on break, he was the living manifestation of all of Ignatius’ fears. His hair had been cut into a mullet, and he wore punk clothes and an earring. A tattoo of a devil’s face—done professionally—flamed on his shoulder. Ignatius bit his tongue and kept faith that the Ancestors would guide his son home. When Ben next returned, he brought three-foot-tall speakers, from which he played Indo rock until he blew them out, after which he would still make them perform into the wee hours like a scratchy-voiced singer. Ben did not last at school. But even after being expelled, he resisted Ignatius’ pressure to resume his apprenticeship on Demo Sapang. Instead, he stayed in Lewoleba, working on construction crews or driving a truck. But eventually he hit a dry spell of work and had no choice except to move back to Lamalera. However, even with Ben installed in his childhood room again for the long term, he seemed curiously reluctant to resume his harpoon training. Ignatius wondered: Why did his son not want to become a lamafa? When Ignatius was young, that was every whaler’s dream. Why should that change just because bulldozers had carved a road through the jungle and airplanes the shape of tiny harpoon heads pulled contrails like white ropes through the oceanic sky? He knew the Ancestors were proud of him and his sons, but he could not tell if Ben felt the Ancestors’ satisfaction too. 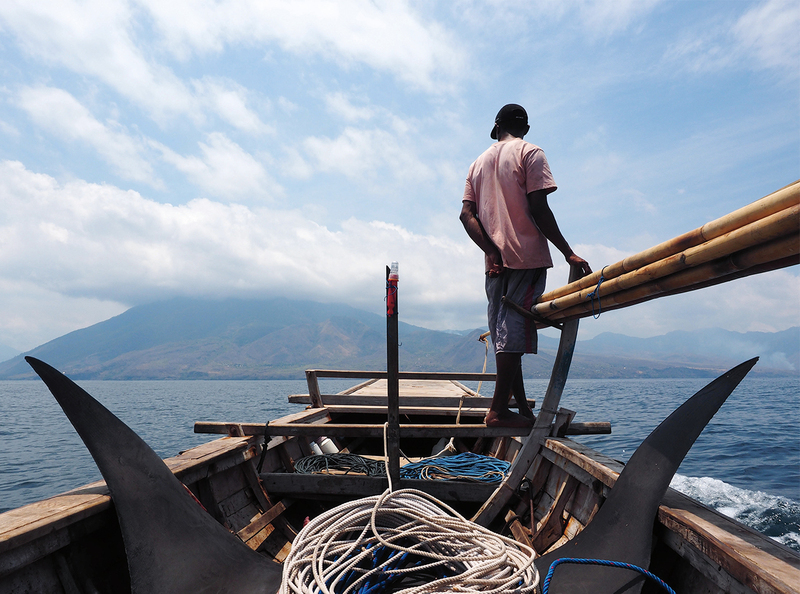 ON JULY 16, 2014, Ignatius and Ben’s older brothers were traveling to arrange details for Ben’s upcoming wedding to a woman from another tribe when sperm whales appeared. Ben faced a choice. It was his duty to drive Kanibal, the family jonson, as a support craft. But with his father and brothers over the mountains today, a nerve-racking possibility had materialized: Could the harpoons fall to him? If Ben wanted to become a lamafa, he should seize command of Demo Sapang. He might not get another chance this good for a long time. Instead he chose to drive Kanibal, which towed Demo Sapang toward the spouts on the horizon, while his distant uncle, Stefanus, took the harpoons. Ben loved driving Kanibal rather than rowing on Demo Sapang, thrill- ing to the power of the jonson’s engine in his hand. For though the Ways of the Ancestors dictated that only the téna could be used to attack the whales, a clever Lamaleran had figured out that using the motorboats to drag the ancient vessels out to sea, before releasing them near their prey, didn’t technically violate the rules—for, in the end, it was just the muscles of men against those of the leviathan, as it had always been. Ben maxed the engine of Kanibal for two hours straight, dragging Demo Sapang all the way into the heart of the Savu Sea, standing as he steered so that he could better glimpse the distant spouts. As they approached the pod, Ben counted the number of times the whales spouted: 12, 13, 14. When he was close enough to see the individual droplets in the geysers, the flukes of six whales pointed skyward and then sank with barely a splash. The whales had exhaled 15 times, which, according to the Ancestors’ wisdom, meant that they would remain underwater for 15 minutes. The ocean was all fractal waves, featureless in their similarity, but since sperm whales fountain at a 45-degree angle in the direction they are traveling, Ben knew to follow the aim of the last spout like a compass needle. Reckoning their speed in relation to the amount of breath they had stored, he led Kaniba to a patch of water distinguishable from the rest only to him. There he idled the engine while the rest of the f leet spread like a noose across the Savu Sea. They waited. Waves rhythmically highfived the hull. Each second, like a wave, repeated the shape and rhythm of the last. Time stretched to its breaking point. Waiting for the whales to breach during a hunt requires a special Zen. It is impossible to be 100 percent attentive every second, or the hunter will exhaust himself before the quarry even arrives. The Lamaleran trick is to slip into a reverie of total awareness, an almost-slumber where the body rests while the unconscious crunches every seabird skimming the ocean, every shadow oiling the current just beneath the surface. Suddenly, cataracts poured off a breaching sperm whale. Everyone was shouting. Ben jammed the engine through its gears, and the rope between Kanibal and the téna strained. When the nose of the téna had reached the whale’s tail, he swung Kanibal hard to the left. The sudden shift of momentum catapulted Demo Sapang forward just as the rope was undone. The oars chopped the water, and Stefanus raised his harpoon. Now Ben was no longer part of the chase. Demo Sapang beat the rest of the ténas to the whale. Stefanus leaped off the boat’s prow and used his weight to drive a 15-foot bamboo harpoon against his 50-ton prey, but he was unable to pierce the foot-thick blubber. The lamafas of a different téna, however, harpooned another whale, and the tree-bark rope drawn taut between the embedded harpoon and the other boat prevented the animal from fleeing. Stefanus clambered back aboard Demo Sapang and attacked. When Ben’s uncle’s spear laced through the trapped whale’s blubber, the animal rolled so violently that it wound the harpoon lines around itself like a giant spool and smashed the two boats together, crushing their hulls. That was only the beginning of the hours-long battle. Sperm whales are too big for even the strongest lamafa to lance a vital organ. Instead, the animals have to be bled to death with a thousand nicks. The whale battered the boats with its massive tail, but eventually it weakened. At the end, it shuddered and vomited 20-foot-long streamers of flesh: giant squid tentacles. Its tail stopped twitching, its blowhole leaked an algae-like liquid, and the only sound was the slap of waves against the téna. I had ridden along on that hunt, and after I witnessed the violence, Ben’s decision to avoid being the lamafa seemed absolutely logical: Dozens of whalers have been killed and maimed over the years. But the hunt also made clear that it is more than just the need for food that keeps the Lamalerans whaling. 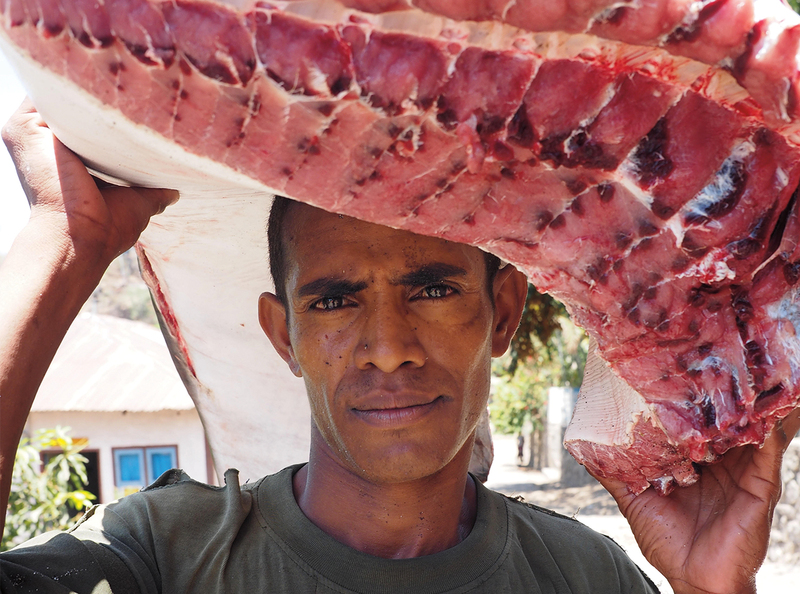 The brotherly coordination the hunters displayed in overwhelming the sperm whale (and, later, in equitably sharing its tons of meat) is the reason that their society is ranked by anthropologists as one of humanity’s most cooperative and generous. And once the whale was slain, as the group prayed for its soul, I realized that the hunt provides spiritual as well as physical sustenance. The Lamalerans believe that sperm whales are gifts sent to them by their forefathers, whom they worship in a mixture of animism and Catholicism. As we sailed home that night, it saddened me that Ben would cut himself off from this cultural wealth, though I empathized with his desire for more material riches. After all, while anthropologists have found that hunter-gatherers report more social fulfillment and score better on other indicators of happiness than people in industrial societies, it is clear that Westerners enjoy a higher standard of comfort and longer life spans. I could see Ben’s decision to seek out a modern life being repeated by many tribal youths, and it made me fear for the survival of the Ways of the Ancestors. IN EARLY 2015, Ben spent the monsoon season—when the storms make it difficult to hunt and many men leave the tribe to earn money—transporting bricks in a pickup truck around Lewoleba, and living with his new wife’s family there. His father-in-law, wanting to keep Ben and his wife close once the weather changed, offered to get Ben a job as a clerk in the region’s forestry department. In poor Indonesian communities, snagging a government position is like winning the lottery, because of the relatively high salary, security, and benefits. Before he decided, Ben said he had to consult with his father, and he returned to Lamalera. “If you become an office worker,” Ignatius asked, “who will take care of me? As the decision sank in, Ben was surprised to discover that his words were actually true. Though he had spent a lifetime lusting after a beer-advertisement lifestyle outside of Lamalera, as he drove construction trucks around Lewoleba during the rainy season he began to see through the fantasies he had once harbored. As his high school friends who had pursued the path of hedonism aged, most of them ended up washed-out, impoverished, and isolated. Life in Lamalera might be materially poorer, but the people who mattered to him were there. And the Ways of the Ancestors had, after all, offered a fulfilling life to his father and other older relatives, no matter how little money they had. He decided he wanted to become a lamafa. A few weeks into the hunting season in 2015, when Ben’s two older brothers were incapacitated by foot and eye injuries, Ignatius called on his youngest son to take up the harpoons of Kanibal. As the jonson motored out to sea, Ben stood on the prow of the boat, unconsciously copying his father’s signature stance—standing on the balls of his feet, hands clasped behind his back, like a gentleman strolling through his estate grounds. Ignatius knelt behind him, preparing the harpoons. Someone shouted, “Devil ray!” A shadow beneath the water flashed in front of the bow. Ben brought down his harpoon with both hands, impaling its torso. Ignatius managed the ropes. Once Ben had finished the prey with a knife, he looked back at Ignatius. If there was any critique to be had, his father would surely yell it. But Ignatius smiled, showing the wicket of his two remaining teeth. Ben would later describe how at that moment a weight had lifted from his shoulders, a feeling so universal that the exact phrase exists in Indonesian just as in English. By the end of that hunting season, Ben had become one of Lamalera’s most promising young lamafas, having taken every type of prey—except a sperm whale. In mid-2016, I watched him harpoon a six-foot mako shark. After we dragged it aboard, it revived from a swoon and began gnashing its teeth, so Ben pounded a detached floorboard into its mouth to prevent it from biting anyone in the tight confines, before severing its spine with his knife. There was an unsung heroism, I thought, in a man giving up a more comfortable life to face such danger daily, all because he believed in the value of a culture many people would consider barbaric. There was an unsung heroism, I thought, in a man giving up a more comfortable life to face such danger daily, all because he believed in the culture many people would consider barbaric. In 2017, Ignatius retired. He felt his legacy was safe, and he had little more to teach his sons. Instead of going to sea with them, he would nap on the beach and wait to see what catch they brought home. One morning in May 2018, Ben led forth Kanibal at dawn. A few hours later, when the hunters spotted the manta ray, it had such a wingspan that at first they thought the darkness sliding across the sea was the shadow of a cloud on an otherwise sunny day. Ben lifted one of his father’s harpoons and leaped to spear the colossal animal. The sun flashed around him as he descended, spear-point leading. The strike was true. The rope yanked taut as the ray rebelled. Ben swam furiously back toward Kanibal. But when he was just a few strokes away, he screamed out. Then he was yanked underwater, leaving only evaporating froth and fading ripples in its place. 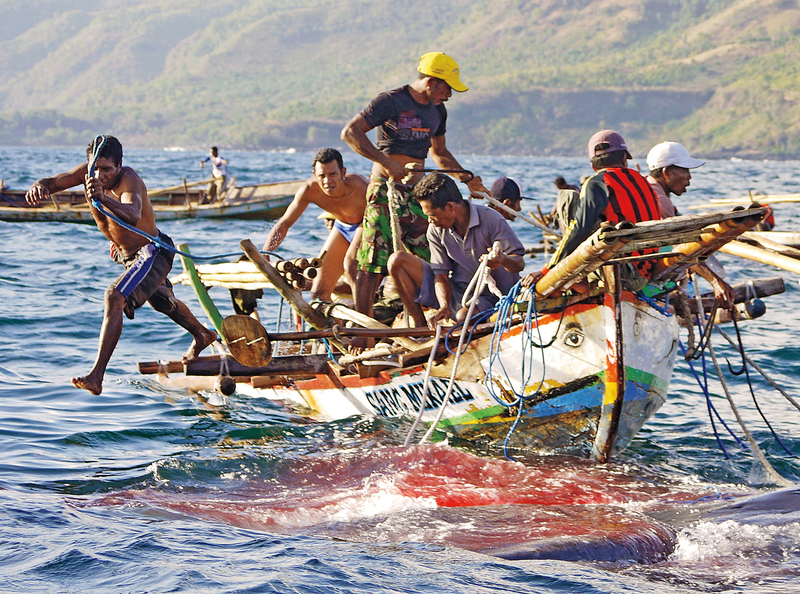 The crew of the Kanibal tug-of-warred with the manta ray, knowing that Ben’s foot was likely ensnared in the harpoon line or that the animal had abducted him in its wings. But the rope went limp, and they reeled in only its, broken end. The water was exceptionally clear that day, with beams of sunlight illuminating its empty upper reaches, but though they waited, nothing rose out of the impenetrable darkness below. For a week, ténas and jonsons scoured the Savu Sea, for if the lamafa’s body was not buried with honors, his displeased spirit might wreak vengeance. But Ben was never found. In the end, Ignatius buried a nautilus shell, hallowed by the tribe because the bone is bent in the shape of eternity. Nothing, though, could fill the hole that this true lamafa had left in Lamalera. The Ways of the Ancestors mean that Ben will not vanish. He is an Ancestor now, and will visit the Blikololong family constantly as a spirit. But the Ancestors have such potency only as long as their descendants honor them, and only as long as there are descendants to do so. For now, at least, Ben’s story is not yet finished.